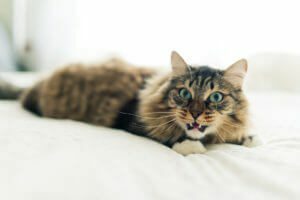 BluePearl specialist, Dr. Peter S. Chapman, describes how hyperadrenocortcism in cats may go undiagnosed and the signs to watch for. Hyperadrenocorticism is one of the most common endocrine diseases affecting dogs with almost 0.5% of dogs being affected during their lifetime. It’s much less common in cats, with only around 100 cases described in the literature. However, it is likely that this is an underestimate of the true prevalence of the disease since many cases with milder signs may go undiagnosed. 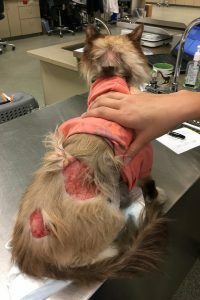 Using a canine analogy, if you only tested for hyperadrenocorticism in dogs with calcinosis cutis, then you would miss around 90% of cases. As a result, it is important to consider hyperadrenocorticism as a differential diagnosis in cats and to appreciate how the presentation and management of the disease differs from dogs. The majority of cases of hyperadrenocorticism in cats – around 75% – are caused by pituitary adenomas. The remainder are caused by adrenal tumors, of which around 85% are benign adenomas. Interestingly, not all adrenocortical adenomas in cats are primarily cortisol-producing. Some cats may present with signs of hyperaldosteronism rather than hypercortisolemia. Hyperaldosteronism causes sodium retention and potassium wasting, which lead to hypertension and hypokalemic myopathy respectively. The most common presenting complaint in cats with hyperadrenocorticism is difficult to control diabetes. Around 80-90% of cats that are diagnosed with hyperadrenocorticism are diabetic because of the physiologic effects of cortisol causing insulin resistance. This is a much higher incidence of diabetes than in dogs with hyperadrenocorticism. This may be mostly due to species differences in physiology. However, part of the difference could also be due to a failure to consider hyperadrenocorticism as a differential diagnosis in cats that are not overtly diabetic. The other typical clinical sign in feline hyperadrenocorticism is thinning of the skin leading to extreme fragility (see image). A typical sign of feline hyperadrenocorticism is thinning of the skin leading to extreme fragility. Cats with hyperadrenocorticism will often present with large tears in their skin and great care should be taken when handling any cat suspected of having hyperadrenocorticism. Even gentle handling or grooming can result in severe skin trauma. The hair coat is likely to be sparse and unkempt with poor hair regrowth at sites of previous clipping. Similar to dogs, cats with hyperadrenocorticism will exhibit polyuria, polydipsia and polyphagia but these signs will often be attributed to uncontrolled diabetes. Cats with hyperadrenocorticism will develop a similar pot-bellied appearance to dogs, but it is common for the generalized muscle wastage to lead to a net loss of weight. The findings on routine hematology panel and chemistry panels will be relatively unremarkable. In contrast to dogs, cats lack the steroid-induced isoenzyme of alkaline phosphatase. Some cats with hyperadrenocorticism may still have an ALP elevation, but this is more likely to be due to concurrent hepatobiliary disease or metabolic changes from diabetes than to the effects of cortisol. There may be a stress leukogram comprised of a relative, sometimes marked, neutrophilia and lymphopenia, but these are very non-specific findings. Abdominal ultrasound may reveal an enlarged hyperechoic liver, but this is also a non-specific finding that can be seen in otherwise uncomplicated uncontrolled diabetes mellitus. Likewise, the finding of symmetrical adrenomegaly is not in itself strongly predictive of hyperadrenocorticism since it can also be seen in uncontrolled diabetes or in cats with acromegaly. However, finding an adrenal mass in a cat with consistent clinical findings should prompt consideration of hyperadrenocorticism. Abdominal ultrasound is most useful for helping to differentiate the pituitary from adrenal forms of the disease and helping to rule out other comorbidities such as pancreatitis or neoplasia. The preferred test to confirm a diagnosis of hyperadrenocorticism in a cat is the low dose dexamethasone suppression test. The test differs from dogs in that the dose of dexamethasone is ten times higher at 0.1mg/kg – this is because the feline pituitary is inherently more resistant to the suppressive effects of glucocorticoids. Samples collected at 0 hours, 4 hours and 8 hours with an expected result at 8 hours of <1.4 μg/dl in a cat without hyperadrenocorticism. The test is sensitive with over 90% cats with hyperadrenocorticism testing positive. However, it must be remembered that any concurrent chronic illness can lead to a false positive result, and the results must be interpreted in light of the overall clinical picture. The ACTH stimulation test is not recommended in cats since it lacks sensitivity – up to 60% cats may test falsely negative – and the response can be variable, necessitating collecting multiple samples at 60 and 90 or 120 minutes after administering exogenous ACTH. The urine cortisol:creatinine ratio can also be used in cats as an initial screening test to rule out hyperadrenocorticism. The ideal treatment for cats with hyperadrenocorticism has not been determined. Responses to medical treatment are generally more variable than in dogs although recent papers have shown some encouraging responses to trilostane. The typical starting dose of trilostane is 10mg per cat once daily. Given the underlying etiology and unpredictable response to medical treatment, hypophysectomy may be the treatment of choice for pituitary-dependent hyperadrenocorticism where such surgery is available. Adrenalectomy is the treatment of choice for adrenal tumors. In general, the prognosis for cats with hyperadrenocorticism is poor. It may take many months for the dermatologic signs to resolve. Moreover, treatment – especially management of the concurrent diabetes – may be complicated by resolution of the polyphagia and reversion to a normal or subnormal appetite. Remission of diabetes is uncommon, and many cats may not have a change in their insulin dose. Although occasional cats may show a positive response to treatment, median survival times of 1-2 months are typical.